All throughout the mountains there are tons of pagodas and Buddhist statues. Linking up the different caves and pagodas are bunches of tunnels, which were quite the relief from the heat and scorching sun. Below are a bunch of pictures from the Marble Mountains. It looked like there were plenty of touristy things you could do there, but we did not spend too long hanging around. We would have stayed a little longer if possible. But, alas, traveling in a group is not always conducive to spending a lot of time in one place. Definitely put the Marble Mountains on your itinerary if you're traveling to Da Nang--it makes a good stop on the way to Hoi An. Although we did not spend quite enough time there, we don't think they necessitate more than three to four hours. 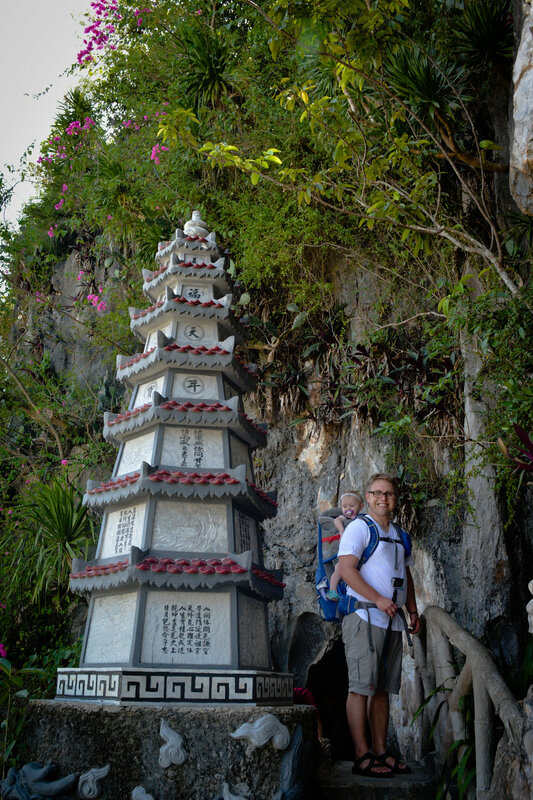 A good, full day could consist of the Marble Mountains and Hoi An. We did those and Lady Buddha all in one day, but felt like it was a little rushed. If you have any questions about traveling in Vietnam with a baby or about our trip in particular, please let us know in the comments below!